Sign into Goodreads to see if any of your friends have read Little House in the Big Woods. Yay!!! I am loving this so far. It's been so long, I wasn't sure how easily I'd fall into the story--and I'm honestly surprised that it's so easy to given the reality that the bulk of what happens is just day to day tasks. But they're day to day tasks I find fascinating, and did as a child as well (I was OBSESSED). 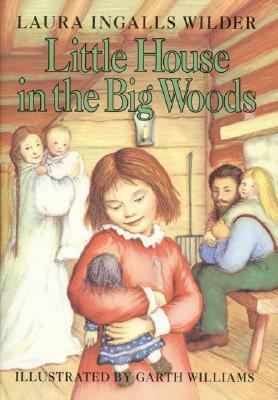 I keep wondering if children today are as easily captivated by Little House books because it's even more foreign to their own childhoods, or if they have a harder time because they're used to more exciting things. For me, I could draw a lot of lines between Laura's childhood and my own--I grew up in the country doing farmerly things (we didn't have a farm, but we had a huge garden, raised animals, etc.). I even said the same prayer every night before bed "Now I lay me down to sleep". But there were also very foreign bits--like the fact that Laura and Mary have never seen a town at this point. I can't even imagine what it must be like seeing a town for the first time! How badly does this make you want to try a grilled pig's tale? Or play with a pig bladder? Or make candy from molasses and sugar with snow? That one seems like something very doable at home. I've always loved stories within stories, which is sort of what lends the action to this book which is mostly devoid of action since they're stuck in a tiny house for winter. I loved the stories of Grandpa and the Pig and Pa and the Bear especially. This is such the perfect cozy read! I need to reread this series. I found the entire box set in perfect condition at Goodwill a year ago. Heeeeiiiidi! I am so happy to be reading these with you. :) I'm so glad you're enjoying it, too. I can tell you that as a child, it is precisely because these books were so far removed from my own experience that I was so drawn to them. We lived in the suburbs, and I had no clue how anything was made or where it came from, so reading about how animals are raised (and butchered and every bit of it used for food and other necessities) was fascinating to me. I also wonder whether these books are still as popular today, though, as attention spans seem short. But it's likely dependent on the child/parent, or having a teacher or librarian handing it over to them. I am SO jealous that you had farmerly experiences, though. We took a couple of school field trips to farms when I was in grade school, but it wasn't until I was an adult that I got to really experience a bit more of that. What you say about them never having seen a town--it's so funny how as a child, everything seems so big and your world is consumed by the things you know and that are around you. I need to look it up again, but I remember reading about the location of their little house in the woods and in modern terms I don't think it was too far from town. But of course, it was much more of a hardship to leave the homestead and travel by horse and buggy. I STILL want to eat a roasted pig's tail, hot and sizzling from the fire! The description of it nearly burning their mouths as they eat up every bit of meat still makes my mouth water after all this time. I totally tried to do Aunt Jemima on snow when I was little. It...didn't work. It seems to me that I always find new things to wonder about every time I reread these. Like Ma putting salt in the bottom of the glass kerosene lamp so it doesn't explode. Do you know why that is? I was asking my husband about it, and he didn't know either. I really enjoy reading about Pa making bullets and the descriptions of the smoke house and making sausage balls. Churning butter, though! What a pain that would be. I'm so pleased that we got a Christmas chapter, too! Cozy mittens and candy. *sigh* I bought materials to make a Charlotte doll a couple of years ago but never got around to it; I'd still like to try it someday. And when they fill their pockets with hot potatoes to keep warm!! I love that. Have you read the Katie John series by Mary Calhoun, by the way? They're less well known, but I loved them--and Katie once used potatoes in her pockets in the winter, too. And yes, the stories within stories are great. I think my favorite is the one with Aunt Eliza and Prince, who wouldn't let her leave the house, but it's awfully hard not to laugh at the image of the pig sledding past the house. Heeee! I'm glad we read to chapter six--I would have had a hard time stopping at just three, hah. So we finish tonight? Lyn (The Heartless) wrote: "I need to reread this series. I found the entire box set in perfect condition at Goodwill a year ago." Ah, they really are the perfect cozy read, Lyn. :) I see them in secondhand shops and thrift shops all the time, too. I was just discussing this readalong with a few people on our Facebook wall, the books are definitely worth hanging onto, IMO. I hunted down the hardback editions I borrowed from the library as a child, mostly on eBay and used bookstores. I bought my mother-in-law a brand new boxed set a couple of years ago, though, and they were still very reasonably priced--it's so weird to me that she'd never read them. Yep! I'm about to settle down with the second half of the book right now! I have not even heard of the Katie John books! The potato thing always makes me think of Little Women as well. I don't think they put them in their pockets specifically to stay warm, but I know they do talk about carrying them and them keeping their hands warm. I do have the version with the Garth Williams illustrations! I love the one with the bear holding the pig too, it made me laugh, and I'm really glad he illustrated a number of things from the story that I probably wouldn't be able to picture in my head without. I totally want some hickory smoked ham now! My brother and I used to raise a steer every year to show and sell at the 4H county fair at the end of the summer, and the men in my family have also always been hunters, so I grew up eating things like deer, moose, and antelope (which is really mostly good as jerky). We never butchered anything ourselves, but I was used to the idea of it. You're right--so much is perspective! I think Pa said he had six miles left to walk to get home when he ran into the 'bear'? So they were probably no more than 10 miles from town. A very long walk, but a ridiculously fast drive by today's standards. I have cousins in Wisconsin and have been there for Thansgiving--it's certainly cold! I also think you're right that kid's getting into these books today will depend largely on their parents/librarians. I know this series was handed to me by my parents, and I'll be doing the same for my own kids! Oh, you'd like Katie John. Worth hunting down through used bookstores if you can find them, as they're sadly out of print. She's a tomboy who gets into all kinds of trouble, but she's got a dreamy, thoughtful streak in her, too. I don't remember the potatoes in Little Women at all! I need to reread that sometime, it's been far too long. A good Christmas read, too. There used to be a store in Santa Monica that sold lots of animation art and original illustrations from children's books, and they had a number of GW' drawings. If I were incredibly wealthy, that would be the sort of thing I would be collecting. I love smoked ham--it's my favorite. You raised steer?! How cool! I went to my first county fair here in L.A. a few years ago and it is AMAZING--we're literally there for hours. Last time we saw pig races, hee hee. The Sprouts store sells antelope burger, so I've actually tried it, and my husband has had venison. We've been nowhere where they've served moose, though. I am such a city girl, I think I'd have trouble adjusting to the idea of raising and then butchering an animal you've become familiar with, so it's always interesting to hear about people who are used to that way of life. Ohhh, Wisconsin...I dearly want to visit some of significant Laura spots some day. Have you been to the Almanzo farm in upstate New York? I was going to visit some friends in Brooklyn last year and I'd persuaded them to take a road trip up north, but I didn't end up going east. I am determined to try again sometime, though. I reread Little Women the Christmas when I got my Kindle--it was the first book I got for it! I have not been to ANY significant Laura spots! I'm actually quite put out with my father for this atm, since his hometown is about 30 minutes from De Smet. I can't believe my parents never took me there! We were always really big on historical trips. Next time that I'm in Wisconsin or South Dakota, I'll have to make the detour. I just checked out a map, and the Almanzo farmstead is nearly in Canada! I think the only way I'd ever make it there is if we stopped by on a drive to Montreal. I liked this second half of the book even more than the first. There were less stories, but more happenings since it covers the other three seasons of the year. We also get to start to see some dynamics between Laura and Mary--namely her being jealous of her big sister, which is endearing and totally understandable. My favorite parts of these later chapters were the dance and the threshing. I love reading about the women getting ready for the dance--I've always been so fascinated looking at old hair styles and trying to figure out how they got done. I also loved seeing the drawing/explanation for the thresher machine. I love this technology! (Yes, I'm equally enamored with watching modern day threshers work.) I also really like that you get the obvious explanation for the term 'horse power'. I kind of love that we still use such an antiquated term today, even though we largely don't have the concept of what it means anymore. I loved reading about all of the other food making processes though. I've always wanted to try making cheese (though I'm glad we can do it without killing calves these days), and beekeeping is another thing that fascinates me. I have a hard time believing that bees don't sting Laura's Pa! Oh, and speaking of bees--I'm with Pa, the little liar deserved the yellow jackets. I had a much easier childhood than Mary and Laura, I didn't have to work as much and got to play more, but I would never have dreamed of being so naughty when asked to help! I have been very impressed with how good Laura and Mary are as kids--they really have to be in a way that kids these days (and in our day) don't. I think this makes them appreciate their play even more. I remember making little houses under trees with my girlfriends as kids! Starting Farmer Boy tomorrow? The chapters are shorter, but the book is longer. Does 10 chapters a day sound good? It would be 10/10/9 really, but that looks like a pretty even page split of ~110-120 pages a day. Oh, please let me know if you end up going, Heidi! I once halfway plotted a Laurapalooza trip, and I wouldn't be at all surprised if it happens one day. I think we discussed this once on Twitter, but where are your other dream literary trips? PEI for me, obviously, and a trip to The Hundred Acre Wood to play Poohsticks. I have others on my list, why am I blanking on them now?! The interactions between Laura and Mary are one of the best parts of these books. As a child, I related quite a bit to the unruly Laura, and that feeling of helpless irritation with the "perfect" other girl who was always well put together. It's interesting to see how their relationship changes as they get older; she writes this relationship with a lot of restraint. No rag curls for me, although I wanted curls very badly. I suppose all girls want to try curls if they have straight hair and vice versa! I am irritated with Ma for making the girls ask their aunt which color hair she likes best, though. When I first started rereading these regularly, I was surprised to find that as an adult I have both admiration for Ma and frustration, hah. It's funny to think about the fact that Ma and Pa were probably quite young here, likely in their mid-twenties, I'd guess. I love the descriptions of the dresses! Especially the aunt's with the juicy blackberry buttons all down the front. I'd like a dress like each of the ones described, including Ma's lovely delaine with the strawberry-like leaves. BEEKEEPING! I'm interested in that too, although I'm afraid of getting stung. I like the description of Clarence's trim gilt-button suit and the shiny copper-toed shoes. His family must be far more well-off and live in town--this time around I'm admiring the details she chose to put in and leave out, giving clues that children likely wouldn't be picking up on. Ma sewing hats! I wish she'd make me one. I went to a costume exhibit recently, and there was also a small exhibit of vintage hats, and there were all kinds of bonnets there. It made me think of Laura and the plain ones that she and her sister had to wear. I'm very fond of the way this one ends. Clearly hunting for food is so important to their survival, but Pa's story about the deer--and Ma and the girls' reaction to it--are really lovely. LOVE this series so much. Michelle, my favorite is Farmer Boy, but The Long Winter is a very close second. It's rare that people pull that one as a favorite, because most of it is so serious. I love reading it when it's cold outside, too! And it makes you especially grateful to be cozy in your own home. How cool that you met an Ingalls, too! So do I, Jen...so do I. This is one I missed as a kid since I was OBSESSED with R.L. Stein at the time these would have been in my radar, tempted to go back now and give them a shot since they're so beloved. Oh, they're definitely worth a shot, Dida. They're written in very simple, straightforward prose, but there's a lot of sweetness and thoughtfulness in the stories. And you learn SO much. It's so interesting to read about this part of American history through the eyes of a little girl who actually lived through it. PEI would be on my literary road trip as well! (I think we did talk about this at some point, but it's fun, so I'm always up for it). I actually was mentally comparing these books to Anne--I reread the first earlier this year and need to do the rest. I feel like those are so much more character focused, while these are event focused, but both come out incredibly charming. It's always hard for me to pick road trip places since I'm mostly a fantasy fan, but still I'd love to go to like Ireland where Sevenwaters would be, or to some Harry Potter places like Scotland (theoretically where Hogwarts would be) and King's Cross Station, and the Wizarding World of Harry Potter of course. I'd probably want to see some Jane Austen esque places in the English countryside. One of the most exciting/crazy things for me after moving to New York was suddenly being able to see/really understand all of these locations that I read about. Thinking about all of the locations for Stephen King's Dark Tower seriesI love this literary map of Manhattan. I do NOT have the Little House Cookbook, but I've looked through it at the library. I remember in grad school when learning to use cataloging terms discovering a whole barrage of literary cookbooks that I went crazy for. You're right about the ages of Ma and Pa--I know I looked this up when I did my post for The Readventurer, and of course they were younger than I am now. I know her editors had Laura move her age up for the books because they didn't think it was realistic to write about a 3 year old having these memories in Big Woods. Oh, and the maple sugar! I've always loved brown sugar best, and I loved hearing about the process. I was really happy that this part was so well illustrated so we could see how the syrup was gathered and made. I'm not sure what kind of cheese I would actually make--soft cheese is much easier to make at home, but I don't really like a lot of soft cheeses, so of course that seems a bit silly. Have you ever read Animal, Vegetable, Miracle? It has a great chapter about their experiences cheese making as well, which set both me and my sister in law off on wanting to try it. I would never want dairy animals though--too much work! My cousin married a dairy farmer and they can never go anywhere. And yes, the hats! I loved that part as well, it made me want a straw hat to wear in the garden. Of course, I have an apartment with no garden atm, but that's besides the point. :P My mom's made wreaths and baskets in the past, which I love and would like to learn how to do someday. I am determined to make it to PEI one day, too. IT WILL HAPPEN. I'd love to see Jane Austen places--I've been to Bath, but that's about it. Oh, Sherlock Holmes places would be lovely, too! And there has to be Louisa May Alcott places? I love that literary map of Manhattan, I wish they'd do it for more cities. I always have the urge to make pie after I read these books, Heidi. Thank goodness Thanksgiving is coming up and I have an excuse. Have you read any of the adult Laura biographies? I've only read a few, but the debate behind the authorship is very interesting. Yes, the maple sugaring was lovely. I liked that Pa brought them little presents, too. I haven't read A,V, M yet, I will have to look it up. And yes, as charming as cows would be, I don't think I'm responsible enough to have one, hah. Alexandra and Melodramatic--this is one of my absolute favorite series. :) It's so nice to hear that other friends love this, too! Wow, this book brings back soo many memories of my childhood. Wendy, do you know of any series that are similarly themed but feature a boy instead of a girl (along the lines of Farmer Boy)? That might be very appealing to my son. Oooh--Concord would be a Little Women place! I bet they have some stuff there. I'll be baking pie Wednesday! I have not read any of the adult Laura biographies, I really ought to. Oh man, I really want to re-read this now! Sarai--in a good way, right?! I'll be baking on Thursday too, Heidi. :) I've only read a couple of the adult biographies, but I want to read...all of them. Alex--you should!! So much fun. Lavinia wrote: "Wendy, do you know of any series that are similarly themed but feature a boy instead of a girl (along the lines of Farmer Boy)? That might be very appealing to my son." The Great Brain series--about a know-it-all boy who grew up around the turn of the century and uses his smarts to swindle those around him. I think they're interesting companion pieces to the Little House series, since they take place close to the latter period portrayed by LIW. Plus, they're funny! And old-fashioned and good. He might also like the Henry Huggins books. Or Homer Price. Are you looking for books with male protagonists in general, btw, or specifically historical fiction? Wendy Darling wrote: "Are you looking for books with male protagonists in general, btw, or specifically historical fiction? " Not necessarily historical fiction, although it might help him learn that little boys didn't die of boredom in the days before iPads and Nintendos. :) I'll check out the Great Brain series - I know he's read some of the Henry Huggins books with his dad and liked them. Thanks for the tips! I love this series. I fell in love with it again when it became a TV series. I remember the first time I read this book to my boys and I told them to imagine a life without TV, Computers, electricity, microwaves, flush toilets, big houses, central heating, and your neighbors were about a day away by horse and buggy. They looked at me blankly. When you think about it, it wasn't really that long ago, either. The amazing thing about this book - just the toys the kids had. A corn husk doll. Actually, the stuff they had - very little. Yet they knew how to keep busy and entertain themselves. The scene with the slaughtering of the pig and how the entire pig was used still sticks in my mind. I had to skip that part with the kids. Didn't want to freak them out. After reading that book, you don't take stuff for granted. Aw, I loved the series and the TV show.